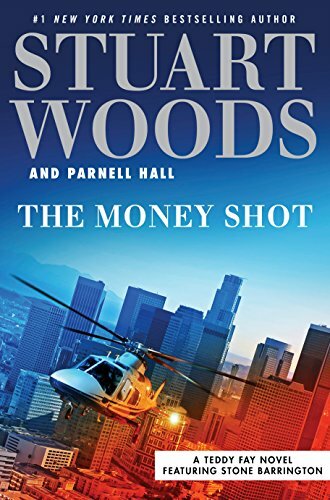 Prolific author Stuart Woods has teamed up with co-author Parnell Hall to write this fast-moving romp of a book, a cross between an old hardboiled '50s black and white crime film and a fast moving James Bond caper. It has it all. Mobs, tough guys, casinos, movie studios, beautiful women, extortion, and double dealing. Who doesn't love books by Stuart Woods? They're creative, cleverly plotted, and peopled with incredibly interesting, well thought out personalities. A recent reviewer pointed out that Woods has millions of fans who will read anything with his name on it. And it's a good thing, too, because new readers are going to have a difficult time following The Money Shot. There is an overabundance of characters in this book, 28 of them are introduced in the first 50 pages alone. One of those characters has more than three names, and two characters have the same first name. The author brought some of them over from his previous books. He's written 70 of them. Diehard fans of Stuart Woods who have read all or most of those other books will be familiar with these characters and their relationship to each other. New readers will be lost. They'll spend a lot of time reading and re-reading in an effort to map them out and commit them to memory. Much of the story takes place on a movie set, and the authors sprinkle in some interesting tidbits on movie making. The main character is Teddy Fay. He's the one with two extra names—Billy Barnett and Mark Weldon. He has multiple personas—actor, stunt man, weapons expert, ex-CIA, and all around master of mystery and intrigue. Leading lady Tessa Tweed Bucchetti calls on Teddy for help when she begins receiving mysterious packages in her dressing room trailer. The first package contains a photo she'd rather not be made public, and a cell phone that rings the minute she picks it up. Because of that, she suspects she's being watched. She expects the caller to ask for money, but instead he demands that she cast an unfavorable vote at an upcoming Centurian Studios stockholders meeting, a film studio owned by her husband Ben. Teddy promises to track down the mystery man. Teddy is adept at changing clothes and donning disguises, then showing up where he needs to be with only seconds to spare and no one the wiser. ". . . He bought a house on Mulholland Drive, sight unseen . . .Teddy had more than enough money in his offshore accounts . . . updated Billy Barnett's credit rating to arrange the purchase . . . hired renowned set designer Marvin Kurtz to furnish it. Kurtz was given carte blanche, since Billy Barnett was on vacation at an undisclosed location and could not be reached." Remember, Teddy is also Billy Barnett. "Teddy also rented a one-bedroom apartment for stuntman Mark Weldon. From habit, he didn’t rent it under Mark's name. No one knew where Mark Weldon lived, and Teddy saw no reason to change the situation. He didn't need to get mail there, and it never hurt to have another safe house. And that didn't stop him from being Mark Weldon as far as the tenants in the building were concerned . . . Teddy drove back to Stone Barrington's house and changed his look from Mark Weldon to Billy Barnett." Get it? Teddy is also Mark Weldon. He can best be described as a fixer. Here he describes the contents of a safe in one of his many residence safe houses: "The selection of handguns was meager but adequate. The lone sniper rifle was not handcrafted, merely a CIA-issued weapon in a case. And the collection of IDs and credentials was skimpy. It would do in a pinch, but not if a specific ID was needed . . ."
The author has kept the chapters short, one scene per chapter as is common in books these days. Every scene has action, something happens, there is no BOGSAT (Bunch of Guys Sitting Around Talking) though the reader will be treated to some mob small talk. And for some additional entertainment read the Author's Note at the back of the book to get a feel for the real Stuart Woods. His website, too. Click on the bio and interview links. You'll be glad you did. There's some interesting personal information, and he answers reader questions.